Perpetual foreigner syndrome strikes again! 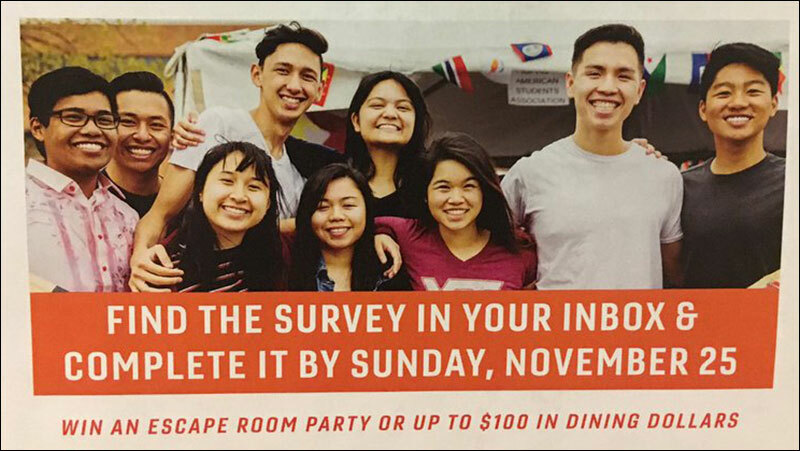 Virginia Tech recently printed up a promotional flyer urging international students to complete an upcoming survey to help make the campus better for international students. The flyer, posted around campus, featured a photo of smiling Asian students at Virginia Tech. You know, international students. Cool, right? There's just one problem: none of the students in the photo are international students. If you're wondering what the problem is, it looks like these students just got inadvertently smacked in the face with the perpetual foreigner stereotype -- the idea that no matter how long or how much or how far Asian Americans make our way in this country, we'll always be perceived as foreign -- never quite enough American. In this case, whoever put together this flyer saw a photo of a bunch of Asians kids at Virginia Tech and erroneously assumed they must be international students. Not the kind from "here." Complaints about the flyer prompted an email apology from Hunter Gresham, Executive Director of Communications and Information Technology in student affairs, who took responsibility for the flyer. "I realize my apology does not quickly nor simply erase the hurt and harm I've caused, and that this instance is but one of many microaggressions suffered daily by those of underrepresented identities," Gresham said. "I also know when it is necessary that I offer an apology. This is, without question, one of those times. I am truly sorry." Virginia Tech's Asian American Student Union posted a response to the incident on its Facebook page, calling the flyer a microaggression that negatively affects the experiences of the students in the picture as well as others in the Asian American community. The Asian American Student Union is calling for public acknowledgement of the incident from senior administration to the Virginia Tech community, the convening of a task force to prevent photos of marginalized student from being used inappropriately, a review of current practices of how photographs are used by the university for the promotion of diversity.